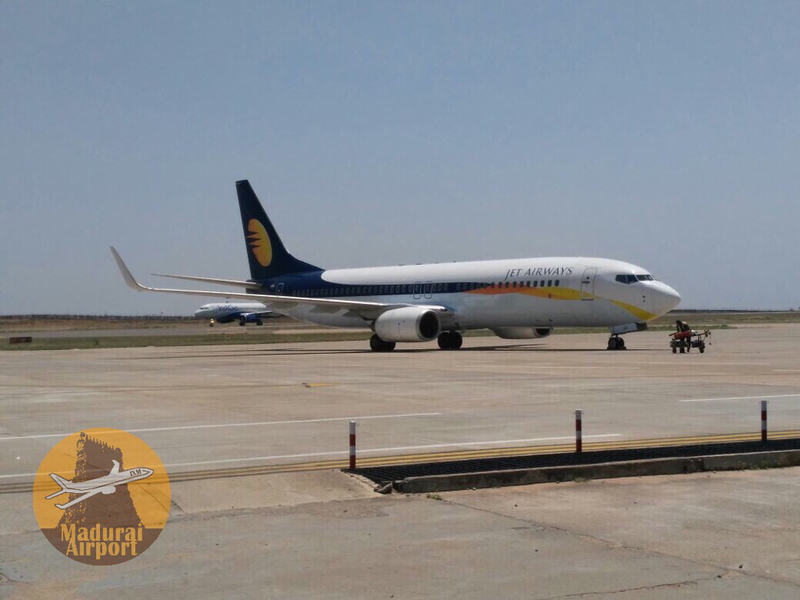 MUMBAI: Jet Airways, India's second-biggest carrier by market share will increase its daily flights to 650 from just over 600 in the forthcoming summer schedule, starting end of March. "The carrier will launch new, direct services to Madurai and Bagdogra, from Mumbai," it said in a statement. "Similarly, the airline will also connect the Pink city of Jaipur with Chandigarh, Dehradun with Srinagar, and Bengaluru with Kozhikode with non-stop flights, aside from services linking Bengaluru with Lucknow, via New Delhi and, Mumbai with Srinagar, via Dehradun," it added. Jet will also add 12 additional frequencies on existing routes across its network. These include a seventh daily flight between Mumbai and Goa, as well as Delhi and Lucknow, aside from a fourth frequency between Chennai–Tiruchirappalli and a second frequency between Delhi and Bhopal. The airline will also introduce two additional services on the New Delhi–Patna route, it said. Tender for increasing domestic SHA area by taking some spaces from International SHA. Work has to be completed within 10 days. This is to accommodate increase in number of bigger planes in afternoon from March 26. CHENNAI: Alliance Air, a wholly owned subsidiary of Air India, will soon be operating a flight from Bangalore to Colombo via Madurai, according to Air India’s regional director, southern region, Captain S Arulmani. Speaking to Express at a function organised to honour top travel agents of Chennai who have achieved high sales and helped Air India grow further on late Friday night, he said schedules are being planned in this regard. He said Alliance Air has planned to operate the Colombo flight from Madurai as it was along the expectations of the travelling public. Similarly, Air India has plans to operate Airbus 320 Neo aircraft from Chennai to destinations like Singapore and Bangkok. “This will happen once we get the additional aircraft,” said Captain Arulmani. Air India is planning to add 100 more aircraft to its fleet in the next three years. Currently, it touches 71 domestic and 41 international destinations. It is also planning to add Tel Aviv and Washington as new international destinations along with one in Scandinavian country which could be either Stockholm or Copenhagen. The national carrier is also betting big on its new four Dreamliner aircraft which it is planing to acquire by October. These could travel at an altitude of 43,000 feet. The travel agents honoured included Riya Travels and Akbar Travels in both International and domestic sectors, Balmer Lawrie in domestic sector and FCM Travels in the international sector. Re: Airport memes - Just for Fun! after deep slumber and reluctance all these years , the Air-India authorities have finally got some awakening . today in the Indian express, there's news about the Bangalore-MADURAI-Colombo service, to be commenced soon. hope it materialises. It is temporarily replacing 1 daily Delhi-Chennai during the same period. As per our source indigo have plan to operate 4th MAA flight. Not sure whether they are just testing it or will continue. ^^ Air asia CEO is consistently demanding the Indian Govt. to fly Madurai for the past 15 long years but the unfair & unreasonable bilateral decisions in Indo-ASEAN treaty is still keeping IXM unutilised whereas the other nearby airport that features as one of the 18 POC's in the treary already is connected with 6-7 daily flights to Kuala lampur (KUL). [quote]As an indication that more foreign airlines would not be allowed to operate international flights from small airports, Minister of State for Civil Aviation Jayant Sinha expressed hope that domestic carriers would meet demands of passengers through Madurai airport. When asked whether Madurai airport will be included in bilateral airport treaties with countries such as Malaysia, Singapore and the United Arab Emirates, he said the government looked at those demands carefully. [color=#BF0040]“If there is indeed a demand from Madurai for flights to international destinations, our hope is that our domestic carriers will be able to satisfy those demands,” he added[/color], while interacting with the media here on Saturday. Earlier, members of Tamil Nadu Chamber of Commerce and Industry submitted a memorandum to Mr. Sinha at Madurai airport, following his visit to Sivaganga to meet party workers as part of Bharatiya Janata Party’s Foundation Day celebrations. Apart from demands for extension of terminal building and immediate commencement of international cargo operation at Madurai airport, the Chamber also reiterated in their memorandum the long-pending demand for inclusion of Madurai in the bilateral treaties so that direct flights could be operated to different international destinations. Presently, Colombo was the only international destination served by a foreign carrier from Madurai. Citing Mr. Sinha, chamber senior president S. Rethinavelu said the government was not keen to encourage foreign airlines to pull passengers from airports such as Madurai to theirs hubs in their countries for onward journey to other international destinations. Regarding their demand for international cargo operation from Madurai, the chamber said the Minister assured them that the matter would be discussed with Home Minister regarding Bureau of Civil Aviation Security clearance. 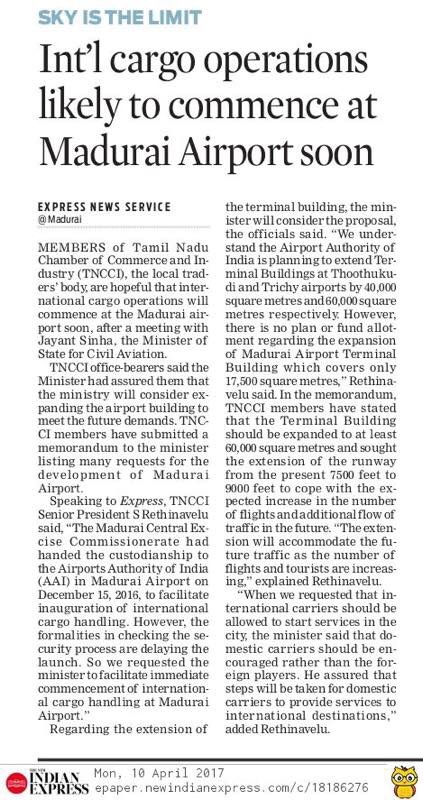 The chamber also demanded that the Madurai airport terminal be extended from the present built-up area of 17,500 square metres to 60,000 square metres and the extension of runway from 7,500 feet to 9,000 feet to meet the growing traffic. yes they will happily allow trichy , coimbatore and even thoothukudi under the nose , all at the cost of our beloved Madurai. how long are we going top tolerate this ? deplorable, disappointing and disdainful. Some works happening air side of the terminal. This is what I mentioned before.